A monster double-album from Can, this is often cited as their greatest work. Side One is probably the best, with all the recognizable Can trademarks: Damo Suzuki's vocals, which shift from soft mumbles to aggressive outbursts without warning; Jaki Liebezeit's mantric drumming; Holger Czukay's production manipulations (e.g. the backwards vocals and opening sound effects on "Oh Yeah"). From there, the band loosens up, getting increasingly demented so that by side three, as Irmin Schmidt's slowed-down cries punctuate "Augmn," you are wondering just what the hell you are listening to. Luckily, the band ends on a comparatively more straightforward note with "Bring Me Coffee or Tea." 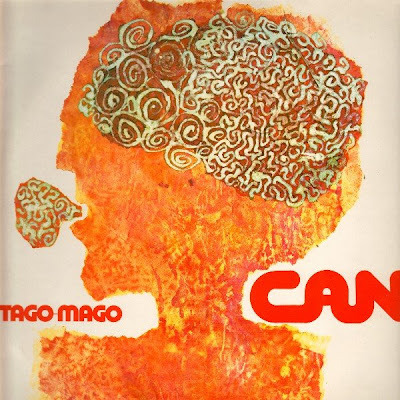 Tago Mago is not the most succinct of Can albums, and I personally prefer the next two, Ege Bamyasi and Future Days, which are compositionally just as good and more refined. Still, if you want a pretty comprehensive idea of what the band at their strongest were capable of doing, this makes a good starting point, especially considering the bargain of a single CD price. Recorded at Inner Space Studio 1971. Engineering and editing by Holger Czukay.